Ski-in/Ski-Out 2BR Condo W/ Hot Tub & Covered Parking. 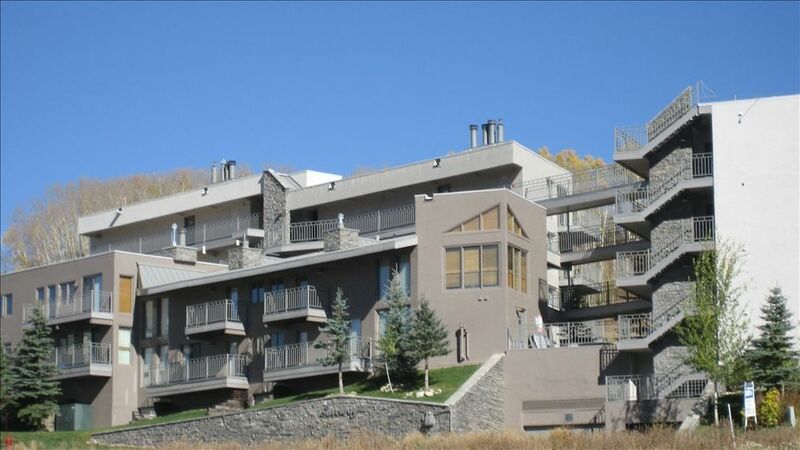 This superbly located 2 BR condo is at the base of the Peachtree Lift at Crested Butte Mt. Resort. Unit #103 is right next to the hot tub and common patio with BBQ. Our condo has recently been upgraded to include new appliances, linens, TVS, and interior decor. Enjoy the beautiful views of Mt Crested Butte from the large balconies. Walk right out the front door and down 1 flight of steps to start your skiing/snowboarding adventure. Perfect for small families or two couples wanting that quick getaway. Moderately priced and fully furnished, you won't be disappointed. With direct flights from Dallas, Chicago and Salt Lake City, into Gunnison Regional Airport (only 30 minutes away), get started planning your next ski vacation. Our unit is professionally managed by CB Enterprises...not one of the large condo companies that makes promises but does not deliver. The condo was so super convenient for skiing. Heaters worked well, new carpet, comfy sofa and chairs. Loved the ski racks and plastic boot mats. We spent the afternoons sitting on the 2 sided porch watching the kids sled! We will definitely stay at Gateway again! Our first time skiing Crested Butte, a true Ski-in/out location. The wood burning fireplace was a great touch. Would choose this condo again the future. Thanks Tom - You are welcome back anytime... bring snow with you again!!!! I've been staying in this condo for years. 20 feet from the slopes, and 10 feet from the Hot Tub. It's a really nice unit with the best location on the mountain and a heated garage to boot. Doesn't get any better than this except one thing.....The management company is second to none. James and Nick take care of everything in a first class way, and are a quick phone call if you need anything! Thanks Charlie - Good to hear from you and glad the snow cooperated (again) for your trip). This location is great for multiple reasons: Only a few feet away from the hot tub, the peachtree lift is right down the steps, and it is a very short walk to the base (<5min) if you don’t mind walking. The included firewood was great, we had a big fire every night. Views are excellent, it’s fun to watch all the new skiers come down near peachtree. We will definitely be booking again next year. Great property and steps from the slopes. Crested Butte was beautiful with lots of runs and lifts. Nice views and excellent fireplace with supplies. All enjoyed hot tub. All in all a wonderful experience. The property was clean and in a nice location to the bunny slope lift (Peachtree Lift) which allows you access to the big Ski Lifts. Also, your view is Amazing!